Uganda will become the first country in the world to give the vaccine against Ebola without experiencing an active outbreak. The vaccine, is already being given out in the DRC. 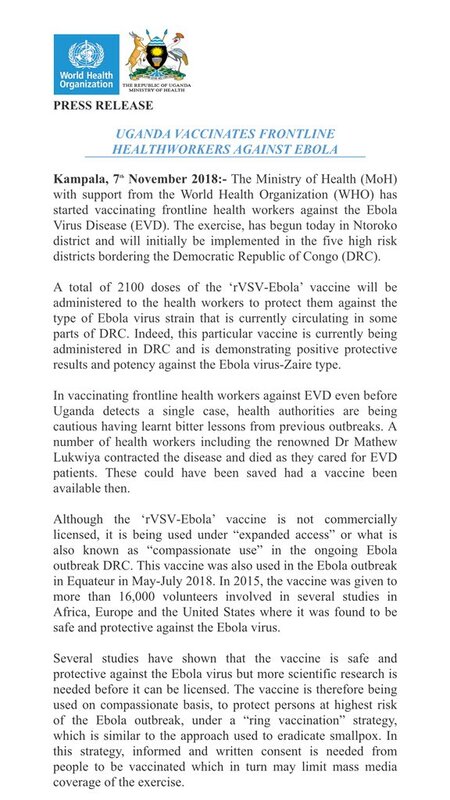 “Considering the high risk that it could cross over from the DRC, Ugandan government officials have agreed to use the vaccine. The focus will be on the first ones who will see patients, or who will be involved in screening and burials,” Yonas Woldermariam, the World Health Organization Representative in Uganda told the BBC’s Patience Atuhaire in an interview. The Health Ministry is set to roll out the Ebola vaccination in five high risk districts next week. The high risk districts are Bundibugyo, Kasese, Kabarole, Bunyangabu and Ntoroko. The Health Minister, Dr. Ruth Aceng, says they have received approval from Institutional Review Board to use the Ebola Zaire vaccine on compassionate grounds. A total of 3,000 people are expected to benefit from the vaccination. Dr. Aceng says the vaccination will target medical workers and people at risk of infection. No Ebola case has been reported in Uganda yet. 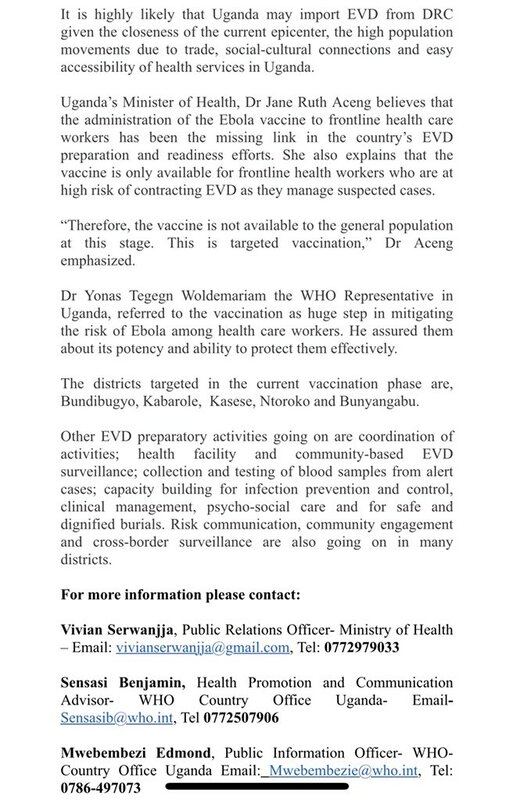 PRESS RELEASE: Uganda vaccinates Frontline healthworkers against #Ebola The exercise has begun in Ntoroko district and will continue in the 5 high risk Districts bordering DRC.